The most difficult national problem facing the administration of President Franklin Pierce was the situation in Kansas. The territory struggled with the issue of slavery. Pro-slavery settlers elected a representative to Congress. Then they won a majority of seats in the territorial legislature. An investigation found that people from the neighboring state of Missouri had voted in the elections illegally. Yet the results were accepted. The new Kansas lawmakers did not like the territorial governor. They demanded that President Pierce dismiss him. Pierce agreed. 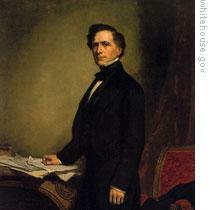 This week on our series, Ray Freeman and Steve Ember continue the story of the presidency of Franklin Pierce. And they talk about the presidential election of eighteen fifty-six. Anti-slavery settlers in Kansas felt they could not get fair treatment from either the president or the new governor. So they took an extreme step. They formed their own government in opposition to the elected government of the territory. Their political group was known as the Free State Party. Party members wrote their own constitution and chose their own governor. President Pierce said the actions of the Free State Party seemed revolutionary. He warned against violence. He said if party members attacked any officials or property of the territory or the federal government, party leaders should be charged with treason. The president gave the pro-slavery governor of Kansas control of troops at two army bases in the territory. Many people feared that the governor would use the troops to arrest the leaders of the Free State government. Fighting between the two sides almost began when a Free State man was killed by a pro-slavery man. Free State settlers gathered in the town of Lawrence and organized a defense force. At the same time, hundreds of pro-slavery men crossed the border from Missouri. They planned to go to Lawrence and burn it to the ground. The pro-slavery governor and the Free State governor agreed to hold an emergency meeting. They negotiated a settlement, and the men on both sides went home. The truce did not last long. In the weeks that followed, a number of attempts were made to stop or arrest the leaders of the Free State government. 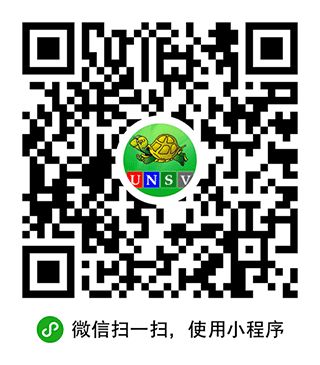 Pro-slavery officials urged private citizens to help. Once again, hundreds of men -- including many from Missouri -- gathered in Kansas. Once again, their target was the town of Lawrence. This time, however, there was no truce. The pro-slavery mob attacked and burned several buildings. A number of people were killed. The violence might have ended quickly. But one of the men defending the town believed that the battle against the forces of slavery must continue. And he believed that God had chosen him to lead it. The man was John Brown. 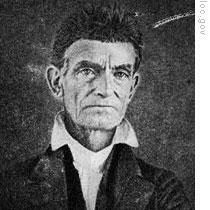 John Brown heard that five Free State men had died in the attack on Lawrence. So he said five pro-slavery men must die in return. He led a group that seized and killed five people. The civil disorder in Kansas continued. Settlers were forced off their land. Houses were burned. More people were killed. The territory became known as "Bleeding Kansas." It was clear that there were deep differences between the northern and southern American states. The differences involved their economies, their systems of labor, and their way of life. The civil disorder caused by these differences was the chief issue in the presidential election of eighteen fifty-six. Three political parties offered candidates: the Democrats, the Republicans and the Know-Nothings. The Whig Party did not offer a candidate. The party had gone out of existence by then. Its members had split over the question of slavery in the western territories. The split could not be healed. Most southern Whigs joined the Democratic Party. Most northern Whigs joined the Know-Nothing Party. The Know-Nothing Party began as a secret anti-immigrant organization. It feared that too many people from other countries were coming to live in the United States. Members did not want to admit that they belonged to the group. When asked, they said, "I know nothing." And that is how the organization got its name. The Democratic Party was led by President Franklin Pierce. Pierce wanted to run for re-election. Many northern Democrats, however, objected to his support of the pro-slavery legislature in Kansas. Other Democrats did not think he was the strongest candidate. As a result, Pierce faced competition for the party's nomination. One opponent was Senator Stephen Douglas of Illinois. Douglas had great political ability. He also had many political enemies. He was the man most responsible for gaining congressional approval of the bill that opened Kansas to slavery. Pierce's other opponent for the Democratic nomination was James Buchanan of Pennsylvania. Buchanan was a northerner who would probably leave the South alone. "I am not friendly to the idea of slavery," he said. "but the rights of the South -- under our constitution -- should have as much protection as the rights of any other part of our Union. " The Democratic Party met in the city of Cincinnati, Ohio. It was the first time a national political convention was held that far west. Candidates needed two-thirds of the votes to win the nomination. After several days of voting, no candidate had received enough. So, in an effort to unite the party, Stephen Douglas offered to withdraw. James Buchanan got his votes and the nomination. The Republican Party was a new political party. Its members opposed slavery for either moral or economic reasons. Many Republicans were Abolitionists. They wanted to ban slavery everywhere in the United States. The majority of Republicans, however, were not Abolitionists. They had no interest in ending slave labor in the South. They simply did not want slavery to spread to other areas. The Republican Party held its presidential nominating convention in Philadelphia. For months, party members had spoken of just one man. He was John Fremont. Fremont had explored the American west. He had been a senator from California. He was young and exciting. Republicans thought he was the right man to lead their young and exciting party. The Know-Nothing Party had a divided nominating convention. Northern and southern members agreed on policies that denounced immigrants. But they split on the issue of slavery. Northern members opposed it. Southern members supported it. Delegates to the convention chose a candidate who seemed to support the party's policies. Yet he was not even a member of the party. He was a Whig, former president Millard Fillmore. Northern members refused to support Fillmore. They broke away from the Know-Nothing Party and supported the Republican candidate, John Fremont. Fremont could not expect to win any votes in the slave states of the South. He would have to get all of his support in the North. He would have to win the votes of the big states, including Pennsylvania. And Pennsylvania was the home of the Democratic candidate, James Buchanan. Buchanan had said that the constitutional rights of the southern states should be protected. So he could expect to win some votes there. When all the votes were counted, Buchanan was elected. Now he would have to deal with the problems that presidents before him had not been able to solve. James Buchanan was sixty-five years old. He had served in the House of Representatives and in the Senate. He had served as secretary of state and as ambassador. He was a good diplomat. But he was not considered a strong political leader. Buchanan usually supported the southern position in the dispute about slavery. He said the North should stop interfering with the South. He even said the South had good reason to leave the Union, if northern Abolitionists continued their anti-slavery campaign. As president, Buchanan believed he could solve the slavery question by keeping the Abolitionists quiet. He wanted a cabinet that shared and supported this idea. We will tell about James Buchanan's administration in our next program. Our program was written by Christine Johnson. The narrators were Ray Freeman and Steve Ember. Transcripts, MP3s and podcasts of our programs can be found along with historical images at www.unsv.com. Join us again next week for THE MAKING OF A NATION -- an American history series in VOA Special English. now this is the days of James Buchanan's, another new president. the issue of the slavery is contuining and it would be kind of moderated by Buchanan. but he had foretold that the south would have left the union sooner or later.